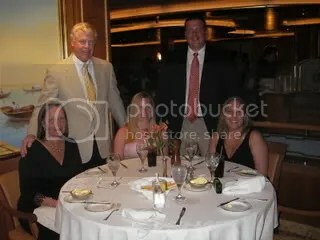 Last Feb. Will and I went on a cruise with his parents and sister! It was their first cruise so they were a little nervous. They were also excited and full of questions before they left. They were coming a longer distance than we were as they live all the way up in Vermont. They flew in one day early to avoid missing their cruise due to air troubles. They stayed at a hotel near the port and had a nice time going to dinner the night before. The next morning they took a shuttle and met us at the pier. They were so excited the got to the pier 2 hours before they began embarkation! Seeing them as they entered the cabin for the first time was exciting. They were so happy and ready to set sail. The first thing they did was walk out on to their balcony, which they loved! We started out our vacation by touring the ship together from top to bottom. My Father in law was very impressed with the size and amenities of the ship. We all had a blast at the sail away party on the Lido deck. We danced and had some drinks hoping to win one of the many prizes. No luck this time though 😦 Maybe next cruise…..
We had tons of fun at each of the ports either taking shore excursions or going off on our own. 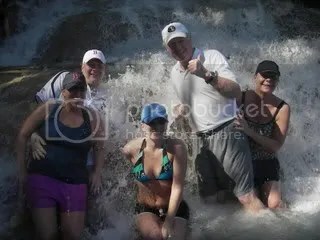 I think we had the most fun as a family in Ocho Rios when we went to Dunns River Falls and lunch at the Ruins. 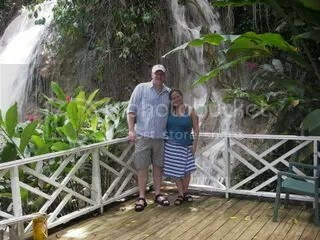 I had no idea what I was getting into with Dunns River Falls…I thought it would be a short easy climb and it was 45 minutes walking up the waterfalls with water rushing down. Luckily we were all holding hands helping each other up. I am so glad we went though cause it was so much fun! Our tour guide also took us all over the Island. Cozumel was fun…. the ladies went parasailing and then we spent the rest of the day at the beach sunning, eating our Nachos, and drinking our pina coladas….Most of us renting snorkel equipment for only $5 a piece and set out to the reef and saw tons of fish! As for the ship, I loved it! 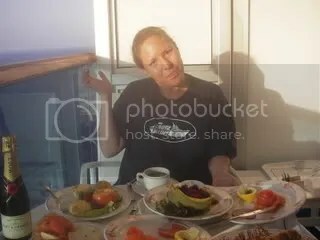 I loved having my cabin in the back of the Aloha deck so that I was right near the back deck where it was never crowded and was an adult only pool. It was also so convenient to grab breakfast from the buffet and sit back take in the view. Our favorite meal was our champagne balcony breakfast, and was so worth it. (see picture below)We had a whole 5 course meal with champagne delivered and set up on our balcony. What a way to wake up! The whole thing was such a blast and we all were able to spend time together like we wanted. 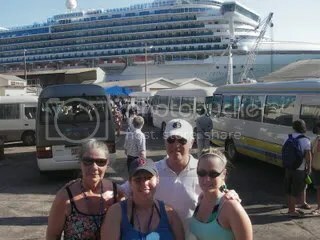 My parents came off the ship ready to do it again…..so I will report back after our next family cruise……..